​WE ARE NOW CLOSED TO SUBMISSIONS! LET THE READING PERIOD BEGIN! Inspired by the BEST PRIZE chapbook contest at Big Lucks, Nostrovia! Press kicked off our Chapbook Contest series early in 2015 to prepare for its third round at the N.Y.C. Poetry Festival. This was all new to us. N! hadn't run a project like this before. Community response took us off guard. Over 80 submissions landed in our inbox within 48 hrs. The support we received throughout the process staggered exhausted evenings with new energy. The year rounded out successfully with selling out the collections within months of their release! 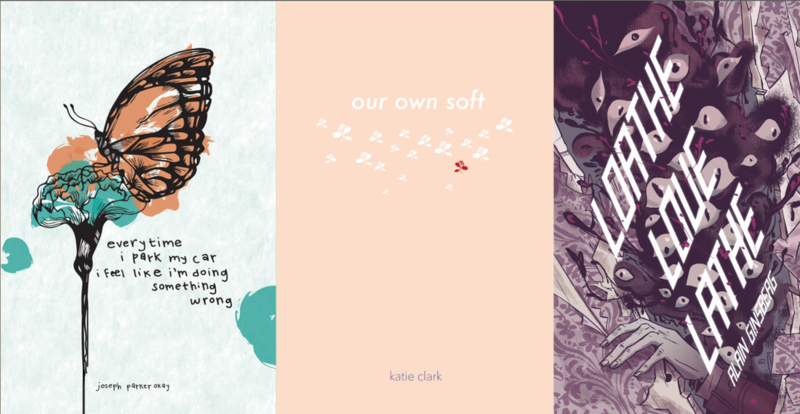 2015's winners are now available as free PDFs, & were awarded "Best Chapbook Series" among The Fifth Annual Beachies. 2016's contest rolled around, and in two days we received over 100 manuscripts! Expanding off of last 2015's experiences, we shared the chapbooks at the 2016 NYC Poetry Festival, setting fire to our van's roof while hitting more festivals w/ our traveling bookstore. We also debuted them as free PDFs after a successful digital-reading-rompus celebrating a fulfilling year! ​2017's contest continued our momentum, with nearly 140 submissions in 48-hours! The 2017 winners have been released into the wild as free PDFs--be sure to dig in! We know so many talented writers are looking for the proper place to send their work and we want to help publish and promote you! With that in mind, each year we pick three winners for this contest, allowing us to publish a diverse set of styles and backgrounds. And since Nostrovia! Press is all about promoting accessible writing and passionate living for our community, submitting to this chapbook contest is FREE! We’re open to collaborations, translation, reviews, art, and anything you can think of–surprise us! Submissions are ONLY ACCEPTED on the designated flash submission days [ 7/27 - 7/29 ]. One manuscript per person, please. Any entry received after the selected dates will not be considered for publication. We read every manuscript, and will have our picks for finalists within one month of submissions!